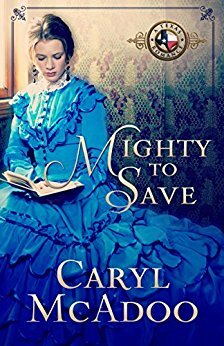 Mighty to Save is the ninth installment from Caryl McAdoo's Texas Romance series. Evelyn marries Nathaniel against her parent's wishes. They did not like he was a nonbeliever of Christ. But eventually he does become a believer and even become a preacher. A beautiful story of faith and forgiveness. I found Mighty to Save to be a pretty good read. It is a kind of read that plays on a reader's emotions. There are scenes of heartache and tears and, also, tender, romantic moments. Such a great beautiful story to show the joy of faith and redemption. I would recommend this book to those who love Christian Historical Fiction. I hope there will be a tenth book of the series in the future. Now, I have a surprise for my followers! Caryl McAdoo is offering to giveaway a print copy of Vow Unbroken (Texas Romance #1). If you would like to enter to win a copy, please leave a comment telling me if you have read any of the books from the Texas Romance series. If so, which ones? If we are not friends on Facebook, don't forget to leave your email address (do the format like this to avoid spam: janedoe at something dot com), so I can get in touch with you if you win. Giveaway will be open until June 7 and I will contact the winner then. Good Luck! I have not read any books in this series but I would love to start with this one. Caryl McAdoo is a great author. Hi Stella! Caryl IS a great author! Good luck and Thanks for stopping by! She's a new author to me, so I haven't read this series yet, but I'd like to! Hi Connie! Glad you stopped by. You would love this series. Good luck! I read the first book in the series and loved it. Vow Unbroken was a super read. I don't typically read much in the way of romantic fiction but I truly enjoyed everything about the story. It wasn't your typically sappy romance and that is what I especially loved about it. Thanks for the chance to win a copy of Mighty To Save. Hi Cindi! Yes, Vow Unbroken IS a super read. FYI, the giveaway is for Vow Unbroken. I have all the books in this series I think, except this one. I do need to read them! Seems I haven't found the time sadly! I've really been wanting to. I guess I will binge read the entire series one day! Hi Nancy! Thanks for stopping by! Good Luck! I haven't read any of her books, love the cover of this one! Thank Amy. Your blog looks great! Thanks, Joy, for the kind words and stopping by! Good Luck! Hi Johnette! I think you would love Caryl's books! Good Luck! Congrats, SplashesofJoy, you are the winner!! Check your Facebook messages! Thank you, Everybody, for entering.